The White-fronted Amazon is the very smallest of all the amazons... but thinks it's the biggest! The White-fronted Amazon Amazona albifrons, is also known as the Spectacled Amazon and the White-browed Amazon. It is the is the smallest of the Amazon parrots, but is totally clueless in this regard. It is a favorite pet bird for its attractive plumage, playfulness, and excellent talking ability. This bird will delight and entertain you with its very large and bold personality. This dynamic little amazon is totally unconscious of its small size. The Spectacled Amazon is only about 10 inches (26 cm) long. They are very amusing with their adventuresome antics. They are very agile and avid about chewing, so need lots of toys and places to climb. These Amazons make a good pet for adults and children alike. They are fairly good talkers and are quieter than their larger cousins. Like all amazons though, they can be a bit noisy and may not be suitable for apartment life. The White-fronted Amazon is one of only two of the 27 amazons species that can be sexed visually. The female is similar to the male but without a red edge on the wing. The other amazon that can be visually sexed is the Yellow-lored Amazon Amazona Xantholora, but this parrot is rarely seen in the pet industry. Like most amazons these little birds are very social, enjoying the companionship of people as well as other amazons. They make a wonderful companion. They do need to be well socialized at a young age to different people and new situations, or as they age they can become shy. This can lead to problems of fright and stress, resulting in undesirable behaviors. The White-browed Amazon will form very strong bonds with their owners, becoming fast friends and exhibit total confidence. They are also a hardy robust bird and can do well in either a cage along with an out-of-the-cage playpen, or kept in an aviary. Distribution The White-fronted Amazon Amazona albifrons was first described by Sparrman in 1788. It is also called Spectacled Amazon, White-fronted Parrot and White-browed Amazon. The subspecies Amazona a. nana is called Lesser White Fronted Amazon and the subspecies Amazona a. saltuensis is called the Sonora White Fronted Amazon and Sonoran Parrot. White-fronted Parrots range from Mexico to Western Costa Rico in Central America; Belize, Costa Rica, El Salvador, Guatemala, Honduras, Mexico, Nicaragua, and Puerto Rico. The are found in a variety of habitats from dry bushy areas to tropical deciduous forests. They most often live as pairs or in small groups up to about twenty birds, but can be seen in groups up in the hundreds. They form monogamous pairings during mating season. They feed on fruits, nuts, berries, seeds. and the blossoms and leafy buds of treetop foliage. They can be troublesome in crop-growing districts as they will also forage in corn fields. Status The Amazona albifrons is on the IUCN Red List for Endangered Species as Least Concern (LC). Description The White-fronted Amazon or Spectacled Amazon has green plumage with a white to yellowish-white forehead and the crown is a greenish-blue. The lores are a bright red that extends back around the eyes. The outer feathers of the wings are edged in a red on the male (but not on the female) and there is a red speculum. The eye is yellowish surrounded by an unfeathered gray-white ring. The beak is yellowish and the legs are a bright gray. Juveniles have less red on the head and none on the wing edge, the forehead is yellowish, their eyes are a dark gray/brown. These Amazons become sexually mature at about 3 - 4 years. They are the smallest of all the amazons, only reaching about 10 inches (27 cm) long from the top of the head to the tip of the tail. Their average lifespan is about 50 years. Care and feeding In the wild, the diet of the White-fronted Parrot consists of fruits, berries, plants, seeds and nuts, corn, and probably some protein. A pet bird will enjoy a varied diet, including a quality seed mix or a pelleted diet, and many fresh fruits and vegetables. Pellets will work if started at an early age. Plenty of human food that is nutritious can be offered. Avocado and chocolate are toxic to any parrot. Housing A roomy cage is required for the White-fronted Amazon. 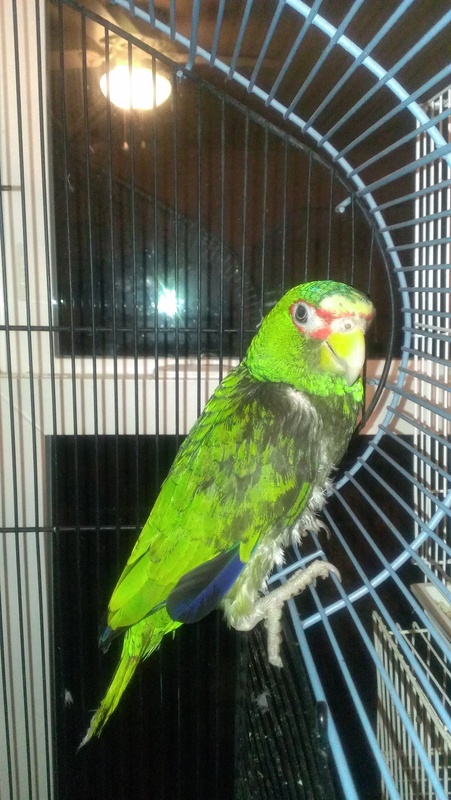 They are very active birds and need to spend a good deal of their time outside of their cage or can be housed in an aviary. A cage must not be too confining, so get one that your pet will be able to feel comfortable in. It is recommended that a cage be 2 x 3 feet wide and 2 1/2 to 5 feet high, and with a play pen top. The White-browed Amazon likes to climb and play, and enjoys expanding its wings. It loves to be out of its cage on a playpen, and will enjoy interacting with their human as well as playing with toys. A hanging perch above the playpen is a great thing to have for climbing. This Amazon can tolerate varying temperatures, but needs to be kept away from any drafts. A variety of perches should be used of varying size and texture. A rougher textured perch instead of the smooth, doll-rod types, makes it easier for them to perch and is better for their feet and legs. A concrete perch can be placed as the highest perch in the cage and next to a toy. At times during the day they will perch there and it will save them (and you) from the ordeal of having their nails filed. Don't forget bathing. Spraying your Spectacled Amazon with warm water or a commercially available bird bath is necessary to keep the feathers from drying out. Social Behaviors In the wild, the White-fronted or Spectacled Amazons are very social birds living in groups. They are seen in flocks, generally small groups of up to about 20 birds, but occasionally in groups of several hundred birds. They also form permanent pairs when they are sexually mature. Amazons enjoy human interaction as well as interaction with other birds. The White-fronted Parrots are social creatures, but they do need to be well socialized when juveniles. Provide lots of different people and new situations at a young age to prevent them from becoming shy as they age. Lacking this proper socialization can lead to problems of fright and stress, resulting in undesirable behaviors. The more your amazon is around people, the more socialized it is and the more it will interact and play with you. You will establish a greater attachment between you and your feathered friend the more you are together. Handling/Training The White-fronted Amazon quickly becomes accustomed to a new environment and its keeper, and is then ready to start bird training. Generally though, you should give a new arrival a few days to get use to you, your voice and its cage before trying to handle it. A hand fed baby will not need much taming and can often be handled right away, as it is use to human attention. Activities The Spectacled Amazon is a very active amazon. It needs a lot of time out of its cage to stretch its wings, although climbing seems to be its favorite activity. It needs plenty of toys to keep it busy, and a hanging perch is thoroughly enjoyed. A moveable perch that can follow you around the house is also great. This Amazon likes to play, loves to wrangle with toys, and is quite an acrobat. They entertain themselves quite well and you will enjoy it. Sexing - Sexual Differences The White-fronted Amazon or Spectacled Amazon is sexually dimorphic, sexes can be distinguished by appearance. Males have bright red feathers on their shoulders and the females have green shoulders. They are one of only two of the 27 amazons species that can be sexed visually. The other, which is rarely seen in the pet market, is the Yellow-lored Amazon Amazona Xantholora. Breeding/Reproduction These amazons are commonly bred in captivity. They become sexually mature at about three to four years. The sexes must be confirmed and the pair must be harmonious, bonded with each other. They will need a nest box that is 31"-39" (80-100 cm) high with an inside diameter of 12"-14" (30-35 cm) and an opening of 4"-5" (10-12 cm). Provide some soft bedding material inside on the bottom of the box. At the onset of warm weather (April to early May) courtship will begin. The hen will then lay three to four eggs which incubate for about 24 - 26 days. The young fledge anywhere from 10 to 12 weeks. As with many parrots, the male will eat for both himself and the female while she incubates the eggs and feeds the young. There is a problem when breeding these birds, the male White-fronted parrot often becomes aggressive toward the female during the breeding season. So keeping a close eye on the pair is necessary. Separate the male if he becomes to aggressive. They may become aggressive towards their keepers at this time too. If you notice any of these bird illnesses in your White-browed Amazon, immediately provide a warm, draft free, secure environment kept at about 86°F (30°C). Place food and water close to the perch where it is easily accessible. An ailing parrot should be taken to a avian veterinarian for diagnosis and treatment. Availability The White-fronted Amazon or Spectacled Amazon is readily available and it should be easy to find one in a pet store or from breeders in your area..
2nd August 2017 posted - I have a young female amazon parrot white fronted/red spectacled any one selling a male white fronted she want a friend in the UK.. It is very hard for me to find a female spectacled amazon, did anybody know a breeder sale the baby female spectacled amazon? I have a lovely female white fronted amazon called tilly and I am either looking for a male friend for her or will be willing to let her go for a minimum amount, or maybe if wishing to breed a baby please let me know. Don't know whether you still have your male white front but need one urgently or am willing to do a breeding thing with my female. Let me know. Hi I have a female white fronted amazon who lost her mate last year and is desperate to find another man to share the rest of her life with. If you still have your young man or are looking for a lady for him please let me know. I am sure we can come to some arrangement. do you still have your female white amazon? we are looking for a mate for our male white fronted amazon. I have a female also and would love to breed her. Who has a male? I am also looking for a female spectacled amazon for my male. we are looking for a female white front amazon. Our male white front is lonely. any ideas where to find one? anyone looking for a home for theirs? I have a female and been looking for a male for years. Hi Linda I have a female and would love to breed her. 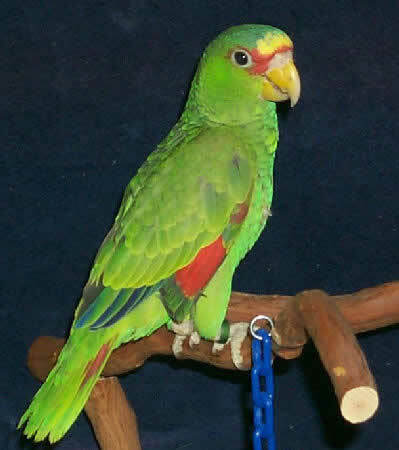 I am still looking for a female white front amazon. any ideas? Or know a breeder?